Sunday and what to do! Having spent many years coming to Symi and walking the mountains and 3 months here in 2010 the “opportunities and possibilities” (quotation from the first series of the Alan Plater Beiderbecke Trilogy, as spoken by the ‘dazzlingly beautiful platinum blonde’, in case you missed it) were countless. Late start not due to any indolence on my part but to the slow upload speed on the WiFi connexion I used. I give incoming e-mails and replying priority so uploading photos to the blog may be reduced. When I finally got down to it, I put together a walk on the hoof, a combination of an easy stroll along the coast, usually done after a mid afternoon arrival on the island, with a longer walk inland and back to the Horio. Very easy after the longer, much more taxing and challenging walks on Nisyros: very enjoyable in a relaxed sort of way. All the more so for calling in where I knew there might be always-unharvested grapes and finding the vines loaded down with perfect fruit. 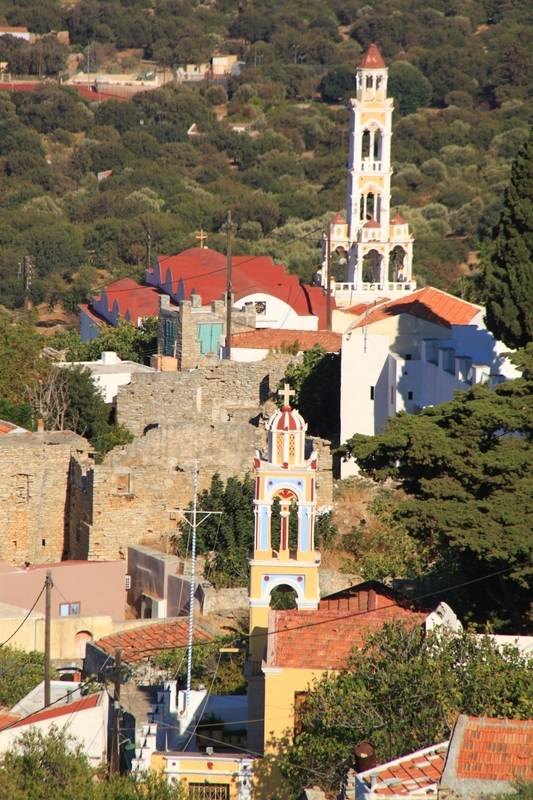 Given that every island has a distinct personality and character there are a number of differences between Nisyros and Symi. 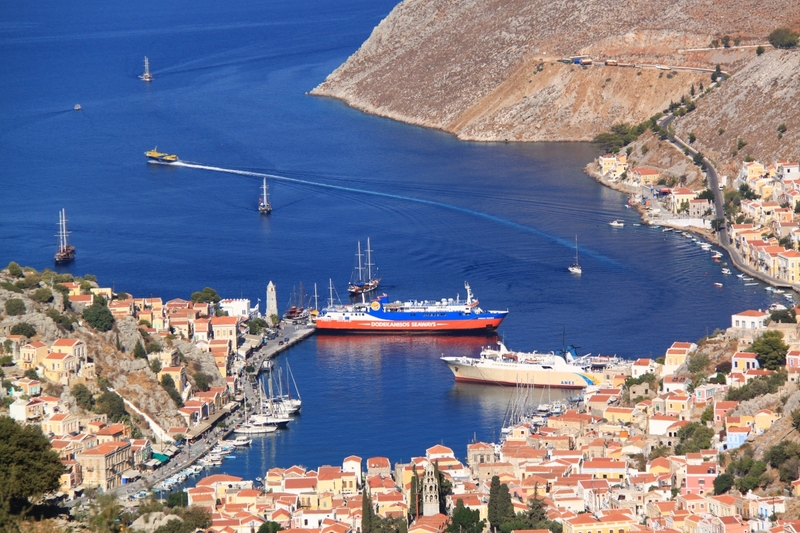 Symi is distinctly more cosmopolitan in terms of the visitors it attracts and the number of yachties calling in on gin palaces and Turkish caiques. Inevitably and sadly this is reflected in the prices of everything. But swallow hard and get on with enjoying this enjoyable island. 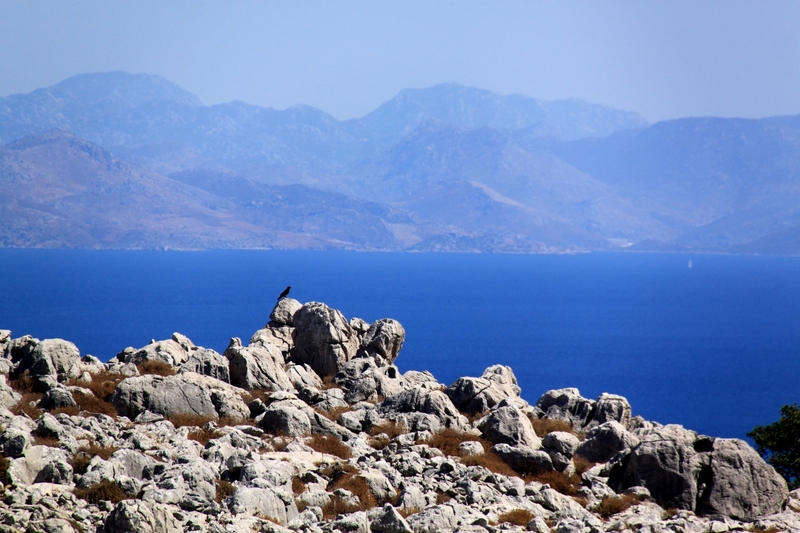 Another major difference between Nisyros and Symi is in the geology and therefore the geomorphology. 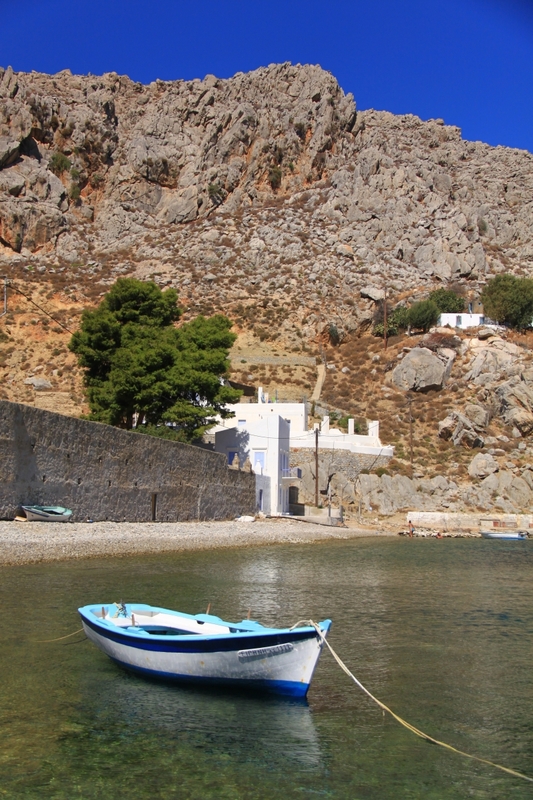 The predominant impact of Symi is that it is a ‘hot rock’. Much of it hugely reflective and very sharp-edged limestone. Sunday’s walk was over some of the rockiest and sharpest terrain. Put a foot or hand wrong in some places where I walked on Sunday and you get razored! Not to everyone’s taste but I love it. The island has the reputation for being the hottest and driest part of Greece and with the wind having dropped and the white rock reflecting the sunlight and radiating the heat collected over a whole summer, hot it certainly was. Another very distinctive difference is that depending upon the particular geology, and therefore the soils, some hillsides are covered in oregano, others in thyme, others in sage and smell accordingly. Much of the mountain I was walking over on Sunday was covered in oregano and it was just about ready for the picking. The oregano you pick and dry in the sun yourself is always better and more flavoursome than what you buy in supermarkets. On Sunday I made a start with collecting for the next year. Good start to the stay on Symi. 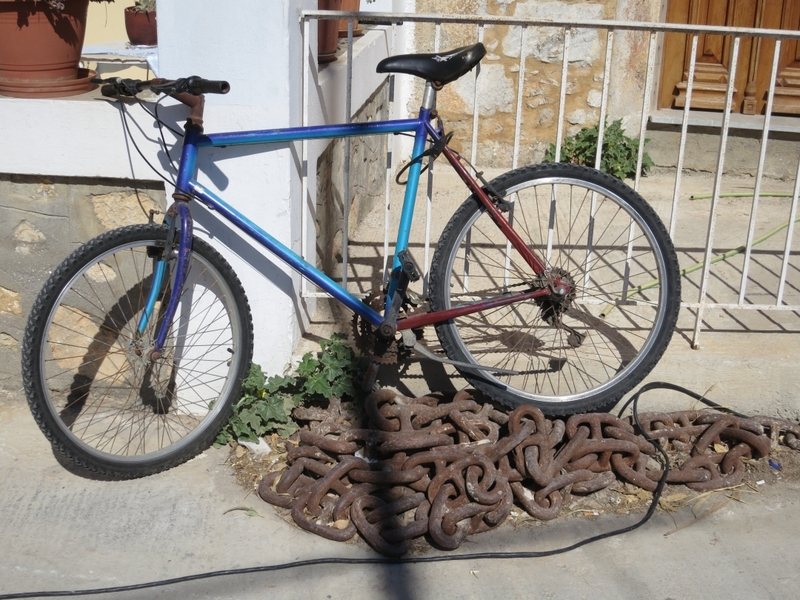 Now THAT’S a bicycle chain! This entry was posted in Greece and tagged Greece, herbs, rocks, Symi. Bookmark the permalink.